Exmoor National Park asked Viper to build on the research produced in ‘From Qualities of Place to Qualities of Experience. Tim Wilkinson. University of Exeter’ to create an engaging and practical resource for tourism businesses. They need a guide that helps tourism businesses move from promoting the ‘special qualities’ of Exmoor to promoting the ‘special experiences’. The research project undertaken by Tim Wilkinson, on which th document is based, explored relations between people and place, aiming to support the sustainability of the Exmoor tourism industry by informing its marketing strategies. Tourism is an important part of the local economy on Exmoor. It is a primary source of income for approximately one third of Exmoor residents. As a National Park, Exmoor is a place where natural beauty and cultural heritage are conserved for the nation. An understanding of the relations between people and place helps to maintain Exmoor as a site for public enjoyment. People find it easier to learn a new concept if it is introduced alongside something they’re already familiar with. 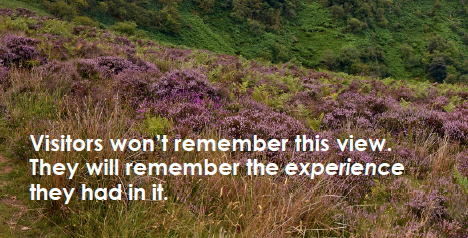 We built on the existing Exmoor Tourism Dream, Discover, Explore brand and brought it to life, literally. We focussed on the stag as a vehicle for creating visual interest. The stag’s experiences reveal what visitors actually want from their visit and it’s not all about great views. Experiential tourism is demonstrated in order that businesses understand how they can achieve increased profits and niche marketing. Each of the five ‘experiences’ sought by visitors is explained with examples, top locations and marketing tips. ​UPDATE: This website from West Withy Farm cottages demonstrates how a business can use experiences to entice visitors and offer them more. 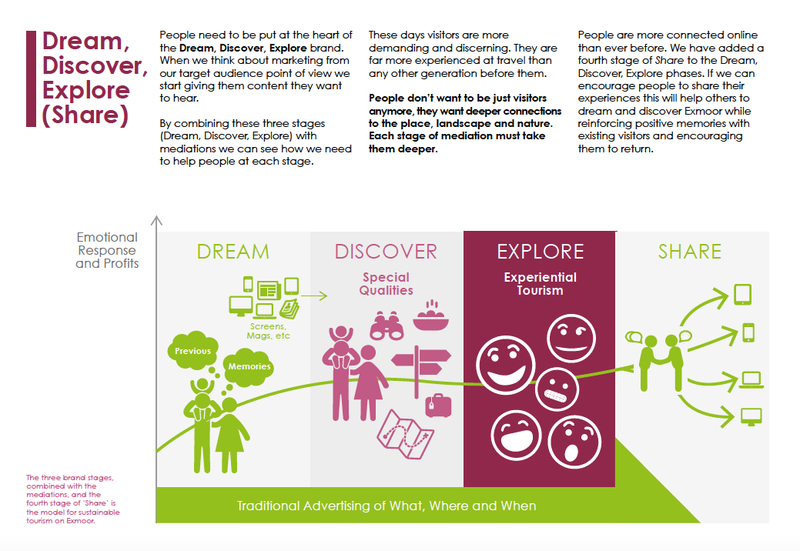 Tourism businesses in the Exmoor area can now see how their marketing interventions help to ‘mediate’ people at different stages; when they are dreaming prior to a visit, when they are discovering where to go , when they are actually exploring the area and then sharing their experience afterwards. This new guide will help ensure the robust academic findings are put to practical use for the benefit of Exmoor’s tourism economy. The visually attractive guide prompts people to think about improving their visitors experiences not just pointing them to great views. Viper presented the document at the 2014 Exmoor Tourism conference in Minehead. You can download the document from the Exmoor National Park tourism support web page.